As a smaller expansion in both size and price, my expectations for Warmind were modest, in keeping with similar prior expansions with the scope of a few new missions and locations to explore. And while the campaign missions are all too brief, there’s nonetheless a lot here for hobbyist players to enjoy. This isn’t the expansion that fully resolves Destiny 2’s flagging long-term engagement problem, but it admirably moves many aspects of play in the right direction, and offers abundant reasons for faithful players to log in on a day-to-day basis. The conclusion of Destiny 2’s core game brought a shift in the status quo for humanity’s Guardians, and Warmind continues the story trend begun with Curse of Osiris, offering follow-through on that moment. The Traveler’s awakening has stirred two sleeping giants in the polar ice caps of Mars, and dire consequences are promised if we don’t confront the threat at hand. Warmind’s story missions are fun to play through, but the ambitious scope of the narrative doesn’t have the time it needs to establish credibility or drama; almost as soon as the threat is introduced, I’ve shot it, it’s dead, and there’s no reason to care anymore. That’s why I was happily surprised that so much fiction, context, and secrets lurked in the post-campaign loop. Warmind applies the philosophy that served The Taken King expansion of the original game so well, embedding hidden weapons, cryptic caches, and nuggets of lore across the Mars landscape, helping exploration to feel meaningful and mysterious. That new exotic Sparrow vehicle is far more memorable because of the scattered data fragments that led to its discovery, and the details hinted about its creator. On a broader level, the Hellas Basin of Mars is a superb new destination, juxtaposing impressive ice caverns against a massive research facility, with lots of nooks and crannies to uncover. Warmind goes to great pains to encourage long-term daily and weekly investment from its players, but the full progression system needs a more dramatic overhaul to be at its best. In particular, rewards are not currently commensurate with the effort involved in achieving them, especially in some particularly challenging (if mostly enjoyable) content like heroic strikes. Across the game, several methods of boosting character power have been tweaked or eliminated, leading to a painfully tedious grind. 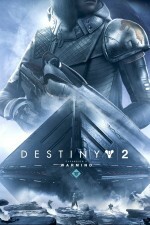 Endgame activities like the new Spire of Stars raid lair and Escalation Protocol have been tuned to be extremely challenging – a good or bad thing depending on your level of commitment – but there’s no doubt that the pool of potential players for those activities is smaller than it could be as a result. The Escalation Protocol wave-based PvE event is the clearest example of a smart idea that isn’t reaching its potential. These big public space fights can be thrilling, but the absence of meaningful matchmaking or grouping options mean it’s rare that a full team is even present to confront the challenge, and the event is often failed almost as soon as it has begun. As more people reach higher power levels this should improve, but once again, some of Destiny 2’s best content is being obscured by an unwillingness to embrace structured grouping of varied sizes. The Crucible is in a comparatively good place right now, with strong balance between weapon types and subclasses. The variety of game types expanded over the course of last season through Rumble and 6v6 Iron Banner, and along with the addition of a couple of strong new maps with Warmind, the variety in playspaces and activities is at a high point. A dual ranking system rewards both consistent play (valor) and skill (glory), though the latter may make the higher-tier competitive playlist even more insular and unfriendly to those who are wanting to give it a shot. The return of private matches is excellent news, even if it was a bit confounding that it wasn’t included in the base game last fall. Contentious issues around the prevalence of team-shooting, weapon slot structure, and time-to-kill are still hot topics among the vocal upper echelon of Destiny 2’s community; these are serious issues, but I’m also sensitive to the developer seeking a middle ground between addressing those complaints, and maintaining an environment that isn’t punishing for the average player. It’s safe to say that we’re looking at a work-in-progress as the Crucible continues to be revised. New weapons and armor are always exciting, but the real star of the show this time is the newly reinvigorated exotic weapons. While a few stinkers remain, many of the exotic weapons finally feel epic and powerful. I face a genuinely difficult choice as I weigh the merits of the black hole-slinging Graviton Lance or the explosive Sunshot hand cannon, and that’s the way it should be. While I’m not ever going to be a fan of the microtransactions, Warmind does a better job of telegraphing the nature of these mostly cosmetic rewards, and offering increased opportunities to find some of them from activities. In a game that is currently suffering from a dearth of fun rewards for day-to-day play, that practice should be increased; public events, world chests, patrols, strikes, and Crucible matches would be improved with a higher chance of some of these appealing cosmetics in the loot pool. Warmind effectively rounds out Destiny 2’s first year, and represents a franchise in a strange period of transition. The game seeks to maintain some of its successful new features, like better destinations and clan integration, even as it simultaneously tries to recapture some of the magic and investment that characterized its predecessor. The weapon is aiming at the right target, and now it just needs to hit that precision shot. Destiny 2's second expansion moves in the right direction, but still has a ways to go before the franchise is at its best as a hobby game.